The odds of anything ever winning this legitimately are astronomically low. I'm thankful that you included any visual indicator of progress at all! The juxtaposition of audio and gameplay seemed really apt until I realised the best strategy (short of cheating) is to leave the level running without pressing any keys for... years? Anyway, I reached around 300 rooms deep using the semi-legit method of manually saving with KS+ whenever I reached a new set of backgrounds. It was pretty exciting when the music started. I then looked ahead in the editor after realising the level could be as much as 1,280 rooms high and potentially hours of effort lay ahead. 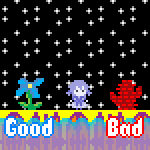 In conclusion, each new Knytt Stories level you put up is less playable and more fascinatingly experimental than the last, and I look forward to the next one. 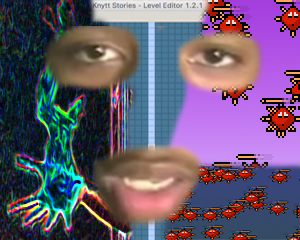 "each new Knytt Stories level you put up is less playable and more fascinatingly experimental than the last, and I look forward to the next one." That is hilarious. I love Glorioustrainwrecks!